Building on a childhood foundation in ballet, jazz, and modern, Jennie has explored a variety of ethnic and folkloric dances from across the globe including West African, Brazilian, and ballroom dance. Investing in her passion for globally connected improvisational dance, she was certified in American Tribal Style® General Skills. A professional background in community health education gives Jennie a unique skill set for communicating concepts to diverse populations, practicing dance safely, and building community through movement. 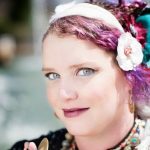 She is currently offering classes, workshops, and private lessons in American Tribal Style® belly dance in central North Carolina.